A large spring storm brought hail, rain, strong easterly winds, and something else along the Washington and Oregon coasts this past weekend. Win many floating objects ashore. The easterly winds are partially driven by what is known as the 'Spring transition' - while winter winds blow in a southerly direction from Baja to Alaska (yes, southerly means from the south), summer winds do exactly the opposite. In the spring and fall months, an intermediate is reached when winds shift and blow either directly shoreward (during spring) or away from shore (during fall). Spring wind storms are a key time for beach combers, as well as marine scientists studying marine debris, as debris is often blown directly onto beaches. This last weekend was no exception, with literally piles of Japanese and local marine debris landing on public beaches along the coast. The first of these was a boat that washed ashore in the Long Beach Peninsula on Wednesday April 23- it was a 20-foot skiff that very much resembles many boats that washed ashore last year from the tsunamis. The boat was encrusted in many barnacles and seaweed and even crabs, which is particularly interesting. Some of the pelagic gooseneck barnacles were up to 19" long! The hundreds of pelagic crabs that were aboard were Planes species. 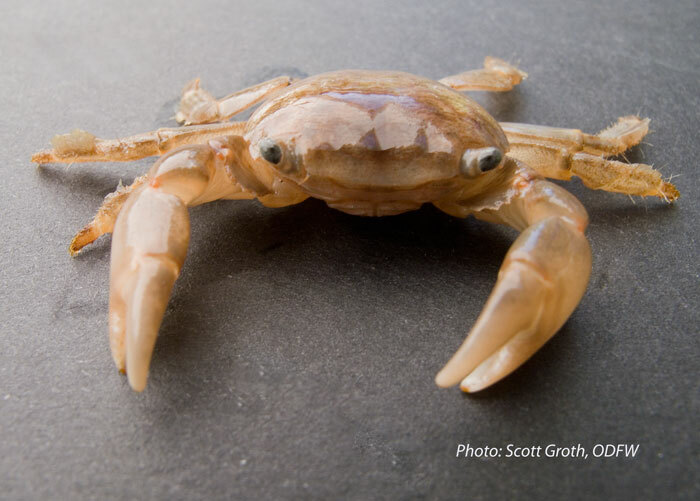 These guys are particularly cute, and are nicknamed 'flotsam' crabs since they are often found floating on seaweed and other objects. Aw. A flotsam crab; hundreds of these were found on the boat found in Long Beach. Learn more about these guys here. The other species found on this boat included the giant barnacle Megabalanus rosa, which is an indicator for Japanese Tsunami Marine Debris, and the mussel Mytilus galloprovincialis. After an onslaught of random debris - this includes bottles, ropes, floats, and other bouyant objects, another boat has washed ashore as of this morning in Ocean Shores, Washington. This particular boat was much more abundant with marine life and included piles of rather robust-looking pelagic gooseneck barnacles (Lepas species). There were also a few Mediterranean mussels (Mytilus galloprovincialis) that are invasive to and not uncommon for Washington. Overall, nothing biologically out of the ordinary appeared to be present (likely because the gooseneck barnacles had a heyday!) Not much information is available regarding this skiff, but it appears to be a 20-25 foot vessel similar to many that have washed ashore. This is an ideal week to get out on your local beach and help report and clean up marine debris! Remember, never handle anything that appears hazardous, toxic, or is covered in oil. Report all potentially-dangerous materials to your local parks department. If you find debris that appears to include potentially invasive species or live specimens, please report this using the OregonBeachcomber reporting form.